Which cold brew coffee maker is for me? There are countless reasons why you may prefer cold brew coffee to a traditional warm cup. Generally speaking, the coffee produced is less acidic and a lot smoother which is perfect for anybody who needs the benefits of the caffeine without the digestive system or taste bud hit. It tastes nicer when the warm weather arrives too, so you don’t have to fight through drinking your warm drink when you’re struggling to cool down. Not only do cold brew makers not require any electricity, but the coffee produced can also be stored for about a week in the fridge without the taste or quality being damaged. You may see DIY methods to prepare your own cold brew coffee, but in the end, only a dedicated maker will produce the best taste possible. If you are tempted, we have reviewed the best cold brew coffee makers to help you find the best one. Proper cold brewed coffee is a completely different taste sensation, as opposed to hot coffee that has just been cooled. This Coffee Gator brewer promises to show you how. Regular iced coffee is brewed hot, quickly cooled with ice and therefore tastes quite bitter. If you get it from a coffee shop, this is usually where the extra flavouring and sweeteners come into play. If you follow the instructions for this Coffee Gator and fill with 75g of coffee granules and 1100ml of water, and leave to brew for about 8-12 hours, the resulting drink is strong, smooth and at the perfect temperature for cold coffee. Because of the extra time spent brewing, cold usually tastes a lot fresher and naturally sweeter than warm. The coffee will stay fresh in the jug for just over a week, so it is ready automatically every morning you come down the stairs while rushing around for work. The coffee produced is quite strong, so you will probably need to dilute it down with some extra water, milk or ice cubes. Thanks to the pouring spout, getting your coffee into your cup is relatively simple and mess-free. It is directed to just where you want it and doesn’t seem to drip after you’ve finished pouring either. Other users have commented that the customer service and communication from Coffee Gator has been exceptional if they’ve been needed. You may think that for this service, and for the quality of the product, you’d have to pay a hefty premium. In fact, it is very well priced, and you aren’t paying extra for it at all. For an effective, easy to use, easy to clean cold brewing device which will keep your drink colder and fresher for slightly longer than average, it is the best choice. BODUM is seen as the innovators of the French Press coffee world, and with this product, they have catered to the joint French Press and iced coffee lovers out there. You use it just as you would an ordinary cafetière; pop the coffee granules in and fill with the water. The difference is that you use cold water rather than hot, and then press once it has been infusing after about 12 hours. It comes with two lids – one for storing in the fridge overnight, and the plunger lid for pressing in the morning before you pour. Changing them over is as easy as you’d expect. They both fit very snuggly onto the carafe, which can sometimes make it a bit difficult to separate the two, but at least you know you won’t have any spills, or too much liquid will come out at any one time. The filter on the plunger is really effective, resulting in a very smooth coffee. There’s none which slip through or are not caught by it, and the plunging action doesn’t seem to make the coffee bitter as with a lot of normal plungers. It is low tech and nothing fancy. This makes it great, though. Easy to use, effective and also affordable. They are dishwasher safe, but we did try washing it by hand and preferred this method as it seemed gentler and able to get into all the corners properly. It isn’t appropriate to make hot coffee from time to time as some people have tried in the past, so if you want a 2-in-1 product you may have to adapt an ordinary French Press. As it is made of plastic, we wouldn’t like to chance our luck. Turning the coffee produced into a hot brew is easy enough though with the addition of boiling water in the cup, and it tastes great as a base. Lid is sometimes difficult to remove. This Hario model is one of the best available. Easy to use, great quality and with a permanent mesh filter, it is also available at a bargain price. The size and shape mean it will fit comfortably in the door of most refrigerators, so even though the lid is not airtight, there is no need for it to be stored on its side. Simply store it in the fridge for about 24 hours, and then remove the filter, so it doesn’t start to over-brew. This will stay fresh in the refrigerator for up to a week. One jugful should, therefore, last one person this long if you drink it once a day. Cold brew coffee is usually much stronger than that produced in the traditional method with hot water, so the end product may need to be diluted before serving. There is nothing to stop you mixing it with hot water to create a warm coffee if that is what you fancy one morning, or simply serve over ice or cold milk. It is straightforward to clean thanks to the filter and simple shaping of the jug. As the material is glass, it doesn’t stain with the coffee no matter how long it sits. Hario are the ‘Kings of Glass’, but as with their other products, the glass is a bit fragile, so you’ll need to be extra careful. Instructions are in Japanese, but there are plenty of videos and manuals online you can follow. Using it is simple enough anyway; add the coffee (or tea) to the filter, pour through the required water, give it a stir, and it is ready to store. You may need to experiment a bit to get the tastes and strengths right, but the easy method makes this simple enough. If you want a cold brew maker which will also produce iced tea on occasion, then the design of this model will make any recipe a possibility. There is the usual fine mesh, which you can pop your coffee grounds or tea leaves into, but there is also an extra fruit infuser basket tube too. Whether you like to add fresh lemon to your tea, or just want to make some fruit-infused water in between caffeine fixes, this maker can handle it all. Both the filter and infuser tubes simply screw on and off to the lid attachment, so you can interchange them easily and take them off to wash out separately by hand which keeps them clean and in good working order. Made from borosilicate glass, the jug will keep cool and also be easy to clean when the time comes. It is suitable for dishwashers, but washing it by hand is easy and simple. As it is tall and slim, it will sit in the fridge with ease, and the stainless steel lid is not only well-fitting but also adds a bit of a classic sleek look. It is resistant to both cold and warm temperatures, so even if you wanted to use it to prepare warm coffee for a change one day, it would withstand the change in heat. The handle is also made from glass, which means it doesn’t feel like the easiest or most comfortable to hold and pour from, but it is strong at least. All in all, it is a good quality product which also looks brilliant, and we feel the price is great for all of the extra functions and features. The Dripster is the traditionally designed, back to basics cold brew drip device for your home. Using the slow drip method, the coffee is full of impact and taste. In comparison to the immersion method, more of the coffee is reached, but there will be none of the bitter, over-steeping taste which regularly affects cafetières. The water jug is made from BPA-free plastic which will stay intact through regular washing. The coffee container is Pyrex-branded glass, so isn’t as thin and fragile as a lot of the other models on the market. A reusable, stainless steel mesh filter is also going to last throughout the lifespan of the drip maker, and won’t taint the taste of your coffee. It isn’t only easy to wash and keep clean, but it is also easy to remove and replace when necessary. We think it would filter out the tiniest of grounds, but it is recommended that you use quite coarse coffee which is more appropriate for the method. There is a valve which allows you to control the flow of the water going through the coffee which in turn alters the taste. It needs careful adjustment to get it just right but when it is working is very effective. Price wise, it is a bit more than most of the other cold brew coffee makers on the market. But at the same time, it is slightly less than a lot of the drip models on offer which seem the same effectiveness. We liked how the entire item was made from see-through materials so you can see the dripping process as it goes along. Not only do you know when it is ready, but it also adds a bit of a style element and talking point. For the price, we think it is actually a very good product that is worth that little bit extra investment. Not only is the KitchenAid 5KCM4212SX compact and neat, but it also features some great extra features which make it perfect for anyone wanting an all-in-one brewer they can take on-the-go too. The portable handle and tap both allow you to take the coffee anywhere you go, whether you be heading off on a picnic or going camping over the weekend. It is easy to carry, and you don’t have to disturb the contents to access it; just turn the tap on, and it will start flowing. It isn’t just for transportability that this is good – set it on the shelf in your fridge, and it is there ready to pour without you having to lift it in and out. Don’t panic about coffee and tea leaking all over your fridge, either. The non-drip tap seems to do exactly what it boasts, with no marks or water left behind when we took it out of the refrigerator. There are markers on the filter and container as a guideline to how much water and granules you need to include. Whether you follow them strictly or like to cater more towards your own tastes, they make it easier to follow. Now, something for anybody who has not yet found a product which offers them a 100%-free of sediment brew. The textured base inside the container catches and traps any loose sediment, so even though it is unlikely it will occur in the first place, your cup is guaranteed to be free of any leftover granules. As you’d imagine with being glass and stainless steel, it is a bit heavy. Obviously, the fuller it is, the heavier it gets, too. You couldn’t carry it a considerable distance, but for popping in the caravan or car, it is ideal. The glass feels pretty sturdy so as long as you’re careful with it, it should last quite a while. With a lot of features and extras to make it easy to use, this OXO Good Grips device is an effective and classically-designed piece of coffee making kit. Firstly, the water drips through a rainmaker filter, to ensure it is spread evenly over all of the granules. The granules are immersed in the water for 12-24 hours. This extracts the maximum flavour of coffee available, so you get the most out of the produce. The pouring process is activated with a switch, so the water will only start dripping when actually turned on. When the carafe is removed from under the coffee maker, the flow of the water will automatically stop, so you won’t create any unnecessary mess or be in trouble if you simply forget to turn it all off before you go to store it. A lid with a stopper keeps it fresh so it can be stored away in the fridge without any air or condensation getting into the coffee itself. If storage and lack of space are some big issues you face in your kitchen, but you don’t want to go without a coffee maker, then the OXO is the perfect answer. All the separate parts all come apart and stack in one small, compact pile so they can be popped away when not in use, or even left on the bench. There are some markers up the side of the carafe, so you know how much coffee has been produced and is left, and you can plan ahead and make some fresh ready for the next day. It states that the coffee will make about 4 cups, but what is produced is very strong and acts as a concentrate, so only needs to be used as a base and will stretch to about 10+ cups in the end with a 1:2 ratio. Making your coffee with this Rummershof cold brew drip device is easy and mess-free. Simply pop 14-16 tablespoons of coffee into the filter and attach it to the lid. Fill the plastic carafe with 1L of water, and affix the top, so it is very tight. Then, once sealed, give it a shake before storing in the fridge overnight, or between 12 and 36 hours depending on how strong you like it. Stir it regularly to prevent any settling at the bottom. After this, the filter infuser can be removed and washed, and you have your coffee ready to go when you need it the most. It can be served hot or cold, either by adding hot or cold water or milk to dilute the cup when ready to serve. The lid is watertight as long as it is sealed correctly, so it can even be stored horizontally without any trouble (it certainly was fine when we tested it, anyway). 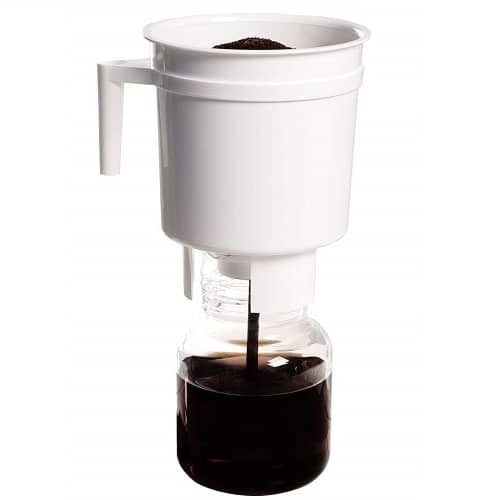 The decanter jug can hold both cold and hot temperatures, so we see no reason why this cannot be used as a hot coffee filter machine too. The handle was one of the easiest out of our selection to grip, as it was a reasonable distance away from the jug but also was made of anti-slip silicone material. For the incredibly good price, it is a great option for anyone who is wanting to start out in the cold brew world, but for the quality, it will also please even the most experiences cold brew connoisseurs. With a reusable felt filter and a storage system which will keep your coffee fresh for up to two weeks, the Toddy has become a cult favourite amongst cold brew fans. There is a reusable felt filter which is really effective at preventing even the smallest coffee particles from falling through to the liquid. It is reusable and will stay in good condition if you give it a wash after every use. Toddy suggests you rinse it with water and no soap, and then place in a plastic bag and in the freezer to solidify and dry. You just dampen the filter before you use it again. It sounds like a lot of faff compared to the others but promises to have an impact on the taste of the end product. Toddy also sells a paper filter bag separately if you want a slightly more gentle taste and an easier clean-up. There are two felt filters included in the pack, but using a paper one may mean these last longer and don’t clog up. The set-up and look of the product are kept simple, but effective. There are good instructions included but everything is quite self-explanatory, and you’ll get to grips with the method even if you’re a complete beginner. Price-wise, we do think it is a bit steep for what it is. Essentially, it is a jug with a separate plastic coffee filter. It is good at what it does but feels more like it should be one of the cheapest on the list as opposed to nearer the higher end. With a large capacity and removable filter, this VonShef model is simple to use and available at a great price. It is the cheapest on our list, so a great starter product if you’re wondering what all the fuss is about with people saying cold coffee is the next trend and the best thing for you. The quality isn’t necessarily reflected in the price; it feels just as substantial and heavy-wearing as most of the others on the list. As the jug is made from glass, it will keep its low temperature, and as long as you’re careful, it will probably last quite a while. The filter is long enough, so the coffee fully diffuses in the water, without the need to shake and stir it all. Because of the design, it would also be a great item to prepare fruit infused water or tea. The brewing process only takes a maximum of 8 hours, depending on how strong you’d like it to be. We found the taste of brewing it for about 6 hours was on par of some of the other models which require an overnight process. It was the most temperamental item out of those we reviewed. The filter was sometimes tricky to get secured onto the lid and took a couple of goes to get right. There were another two occasions where it seemed fixed, but then once it had been sat in the water for a while, it seemed just to pop out. Overall, it is inexpensive but still just as good as some of those over twice the price. For any newbies to homemade iced coffee or anyone who just wants a basic item which will produce a decent coffee base, it is worth a shot. Any coffee fanatics or experienced brewers may prefer to invest in a more reliable item though. Think about how many cups you will need throughout the time it will keep fresh. Most cold brew coffee blends are stronger than fresh hot coffee once they’ve brewed, so you will only need around a third of a cup before topping up with water or milk (around 100 ml of coffee). If you make one cup per morning, you’ll need roughly 700ml, and so on. Also, take into consideration the brewing time. Most will take about 12 hours at the least, but a maximum of 36 for a stronger taste or bigger batch. If you want to make a fresh jugful when you’re running low, so you’ll have it ready in time, it may be worth investing in a separate cold thermos flask for keeping the coffee in the fridge once it is running out. On the topic of storage, make sure your fridge will accommodate the flask. The majority need to be stored upright in the milk shelf, so check the measurements against the space you have. The price of cold brew coffee makers generally starts at around £10 and can increase to over £100. The more expensive ones aren’t necessarily better than those that are at the lower end of the scale, but there are sometimes little tell-tale signs regarding quality. Some filters may be better than others and other parts, such as lids or handles, may be better quality. In general, however, all of those we reviewed are good enough quality to have made it onto our list of the best cold brew coffee makers. Cold brew coffee is made with cool or room temperature water, so the extraction rate is lower. It takes longer to make a coffee, therefore. Most of the makers will recommend a brewing time between 3 and 24 hours, depending on how effective the filter process is and how strong you like your coffee. Cold coffee can either be enjoyed as it is straight out of the brewing jug (it may need diluting with some more water), with milk and ice or as a base in a long drink or cocktail. There is also nothing to stop you warming it up again, either in a microwave or by adding boiling water. Is cold brew coffee concentrated? The extra brewing times make it stronger, so you will likely have to use it as a concentrate and dilute it down. This can either be as a 1:2 or 1:3 ratio with hot or cold water, or with milk and ice for a traditional long iced coffee. Why can’t I just cool my warm coffee? Aromatic coffee oils and flavours will dissolve at cold temperatures if they are given enough time, but the acidic substances in coffee will only dissolve at high temperatures. This is why your hot coffee can sometimes taste a bit bitter, especially if it is left to sit for a while. These sour tastes are still present when you cool the coffee down, but because of the cold temperatures, they don’t taste nice at all. Preparing your coffee cold results in a softer, mellower and smoother taste without all the negative aspects, and does not taste acidic. Cold brew coffee is therefore perfect for anybody who finds it hard to drink warm drinks due to acid reflux or other digestive issues. What type of coffee shall I use? Wondering whether to get coarse or fine ground coffee? If your coffee granules are too fine, then they will likely slip through the filter. A coarser blend will stay put, and not move through to create a sediment at the bottom of your carafe. It will also result in a clearer brew and slightly milder taste. For this product, it is also important to ensure your coffee granules are essential for cold brew. Some will state on the packet, or just say that they’re only for standard coffee. If you do have a favourite blend, it may just be a case of testing the taste. Do the coffee granules have to be fresh? Because the more acidic solubles and oils are not extracted in the cold brewing method, the coffee granules don’t have to be as fresh as with preparing hot coffee. This makes cold brew perfect for anybody who loves to grind a big batch of their own beans for the freshness, but are then left with a lot of leftovers which immediately start to taste a bit off and stale. There will be no difference in the taste or level of sweetness.